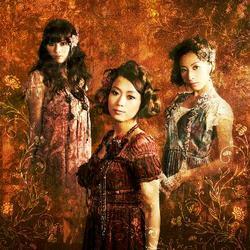 Kalafina is a songstress project that started from female vocalist auditions held by hit maker Yuki Kajiura. Many times during the auditions, the singers with voices that met with Ms. Kajiura's high expectations, performed each of the songs composed by Yuki Kajiura, and the best vocalists were selected forming the style of this group. Surely as each song differs, the charming music from these singers will begin to take shape. Wakana, Keiko, and Hikaru, the three of them together, are Kalafina. The group put on a vivid debut on January 23, 2008 with their single "oblivious". The debut single "oblivious" reached #8 on the Oricon weekly chart, Japan's equivalent of the Billboard Music Chart, and following that, their second single "springer/ARIA" and third single "fairytale", part of a 3 title/CD series release, got them into the Oricon Chart Top 10. They recorded a big hit with being asked to do the theme song for the animated movie series "The Garden of Sinners" (Kara no Kyokai). With more than 500,000 copies of the DVD sold, "The Garden of Sinners" (Kara no Kyokai) is currently the most widely noticed anime series in Japan. On March 4, 2009, Kalafina will simultaneously release their first album "Seventh Heaven" along with their fourth single "Lacrimosa". "Lacrimosa" is the ending theme for the popular TV anime "Kuroshitsuji" (Black Butler). Wakana was discovered by Ms. Kajiura and appeared as Fictionjunction WAKANA. She is the singer whose voice has quite a range and overflows with a refreshing feeling. Keiko was discovered by Ms. Kajiura and appeared as Fictionjunction KEIKO. She is the singer who has a charming bass tone voice. Hikaru was one of the people discovered by Ms. Kajiura from among 30,000 people who tried out for Sony Music's audition. She is the singer who has a voice that is blessed with a feeling of transparency and tension. Yuki Kajiura is a multi-music composer who handles lyric and music composition and music arrangement and has experience with extensive music production for movies, anime, video games, musicals, TV, etc.